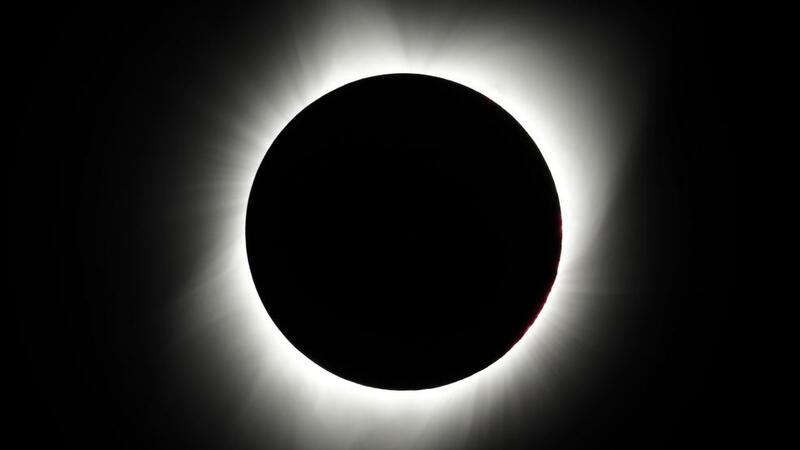 WASHINGTON (Sinclair Broadcast Group) - The first total solar eclipse visible across the entire continental United States since 1918 passed over the country on Monday, captivating millions as it slowly darkened the sky. The eclipse began its path across the U.S. over Oregon around 10:15 a.m. local time. Prior to the moment the moon completely blocked out the sun, crowds gathered and vehicles jammed roads and parking lots in central Oregon. Thousands waited overnight in camps and parks in Salem, Oregon. At the Santiam Rest Area on I-5 in Jefferson, people unpacked chairs and telescopes along the side of the road. For skywatchers in parts of Oregon and Washington, the sun began to be eclipsed soon after 9 a.m. local time, with the totality of the sun covered by the moon about 70 minutes later. As the process began, KATU reporters on the ground observed the sky darkening, the temperature dropping, and a breeze picking up. Salem Airport in Oregon registered a 4-degree dip in temperature during the eclipse. In Madras, Oregon, an audience of eclipse enthusiasts applauded the moment the sun disappeared around 10:20 a.m. Similar scenes played out along the path of totality in advance of the eclipse, as amateur astronomers, families, and others awaited an event that has not occurred in nearly a century. Even some cities outside the path of totality like Washington, D.C. saw crowds taking to the streets to watch significant portions of the sun obscured by the moon. As anticipation of the event grew in recent days, glasses enabling people to view the eclipse safely became scarce in many areas. While parts of Idaho became engulfed in darkness, some on the East Coast began to see a sliver of the sun blotted out. The eclipse is casting a shadow over 2,600 miles of the U.S., crossing over 14 states in the course of about three hours Monday. The path of totality, where the sun will briefly be completely blocked, is 60 to 70 miles wide. While this alignment between the Earth, sun, and moon occurs somewhat regularly, it is very rare for a total eclipse to pass over the whole U.S. from coast-to-coast. Part of the U.S. will see another total eclipse in 2024. After the eclipse passed, there were reports of extremely heavy traffic in Oregon as the thousands who came out to witness the spectacle began to head home. Reports of delays and backups followed in other states along the path of totality.